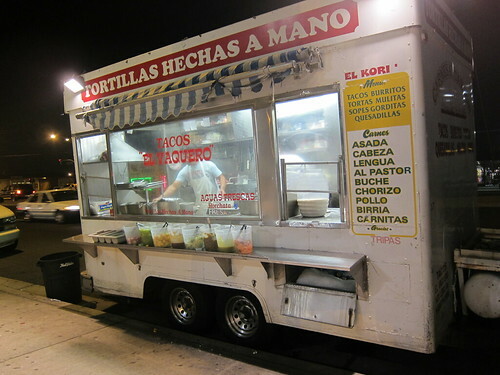 Last September during the 30 taco trucks in 30 days extravaganza, I saw these two trucks on Hawthorne Blvd in the city of Lennox and made a mental note to come back to the area to see how they compared to Taco Dollar, and Tacos El Comal. 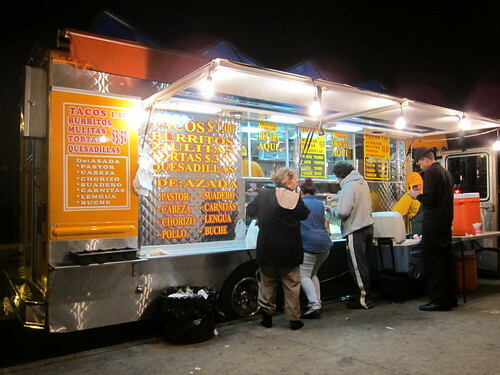 My first stop was Tacos El Gordo, which was one of the shinier trucks I’ve seen. 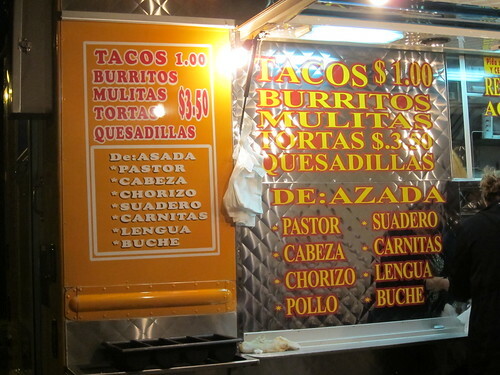 Cleanliness is a major plus when it comes to street food, and its good to see some taco trucks go the extra mile. Even the salsa bar was nicely manicured; the tubs of salsas were packed into ice, each with a ladle that made it easy to pour on top of each taco. I ordered carnitas, asada,al pastor, and then a rush of patrons came and we all played a game called - who’s going to take the longest time at the salsa bar while other people are waiting. Except my only involvement in this game was that I had to wait with my plate of tacos in hand for someone who ordered after me to finish bagging up all their condiments and salsas for food that likely wasn’t going to be ready very soon. At least, not as soon as my tacos, which were already ready and dying a quick death while this game played out. Not even my body language or standing in plain view, taco plate in hand, garnered any sympathy from our man who was bagging up and cupping enough salsa for a feast. Eventually, the great salsa plunderer acknowledged me and declared a lull in his great salsa and fixin heist. The star of these tacos was the salsa. All three, even the avocado salsa, had a good amount of heat, and the salsa verde had great chile flavor . I love a spicy salsa verde; the simple flavors of tomatillo and serrano pepper may be my favorite salsa for tacos. The meats were well prepared, the carne asada was greasy and flavorful, and the carnitas was juicy with little crispy bits. The al pastor wasn’t cut from the spit but any shortcomings the meat had were lost in all the flavor from the delicious avocado salsa. I probably would have ordered three more if I hadn’t already decided to try the truck down the street. The truck down the street was Tacos El Vaquero. Tacos El Vaquero used to park at the corner of Inglewood and Imperial Highway where they also had a brick and mortar location that is no longer. 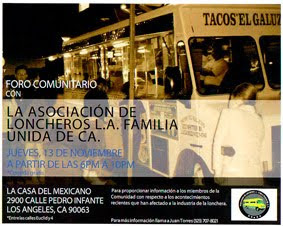 It’s not often you see a taco operation downgrade from brick and mortar to lonchero, it’s usually the other way around. I ordered carnitas, al pastor, and carne asada and garnished the tacos with onions, cilantro and salsas. 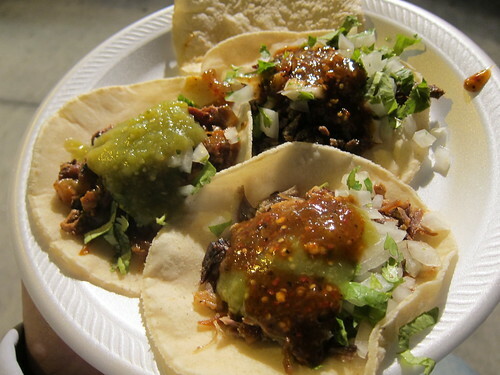 The most glaring weakness of the tacos was the bland salsas; the salsa verde tasted as if it were just a blend of tomatillo without any chile and the salsa roja was a very weak guajillo chile salsa. The carne asada and carnitas were quite good, but I only wish I had plundered a bit of salsa myself from El Gordo to make up for the lack of heat. Without it these tacos were just mediocre, as were the tortillas hecha a mano. Even though El Vaquero serves tortillas hecha a mano my choice was easy. Tacos El Gordo serves my kind of tacos; small, greasy bombs of flavor topped with spicy chile salsas that make you reach for that cold beverage. How much does cleanliness figure out into your ratings? Does it figure into them at all? I only mention this since you pointed it out in your review of the first truck. 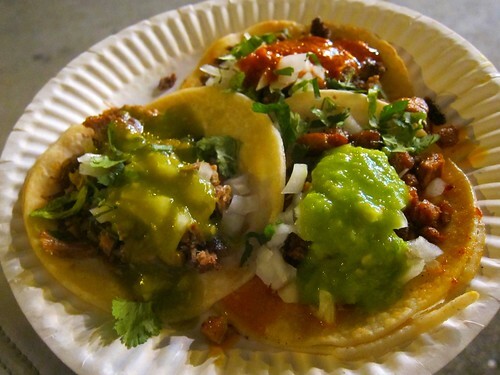 Also, since salsas and toppings can often make or break a taco, how much weight do they hold on the ratings. Overall, great post! The second plate looks delicious. it plays a factor. If the outside is clean the inside is probably clean too. Most of the trucks I've been to are clean. my ratings aren't really an exact science. I can be pretty swayed by a great salsa though.